A beautiful garden is calming and relaxing and can add value to your property improving your outdoor space easily and affordably. We build low maintenance, drought tolerant gardens that are natural and functional to complement and enhance your outdoor lifestyle. If your garden needs a complete make-over or is in need of just a little work, we offer landscaping services to improve both the health of your garden as well as the appearance. My Garden Rocks can transform and upgrade your garden and outdoor space with the use of rocks, mulch, turf, plantings, stepping stones, feature pots and more. Regular garden maintenance helps to maintain the general health and condition of your garden. We will ensure your garden has a beautiful, professional, and tidy presentation so you can enjoy your outdoor living – and it won’t be such a big job every time! Martin is a qualified Arborist and has obtained over 20 years experience in this field. We offer a full line of planting service for residential properties. Whether planting trees, shrubs, evergreens, succulents, perennials or annuals, My Garden Rocks can professionally and reliably handle all your planting needs. 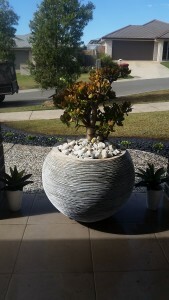 We take great care not only when selecting the right plants for your location, but in the installation process as well. We go to great lengths when choosing our growers and providers. Mulching can be one of the most beneficial things you can do for your soil and your plants. It can be a labour-saving device that adds to the beauty of your landscape. Rocks are one of the most versatile elements available for a landscape makeover. Rocks add texture and contrast, serve as a durable groundcover and require little or no maintenance. 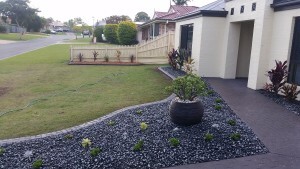 Landscaping rocks come in a variety of sizes, colours and quality. The type you choose depends on your needs. There are dozens of ways you can use rocks to create a picturesque setting. One of the most common displays is a rock garden. You can also plant bright, vivid foliage around various types of stones to lend an appealing contrast to your garden. Raised garden beds can be useful for everyone, and look great. They are ideal for people who have trouble working at ground level, but are also a convenient way to create perfect planting conditions for your edible garden.We have created veggie gardens, decorative gardens and much more in a range of shapes and sizes. Feature Pots offer your garden great versatility, and are a fantastic way to add impact to your garden. There’s now a myriad of textures, designs, colours and sizes available to choose from. Martin can help you select the most suitable plant depending on individual taste and position of your feature pot. 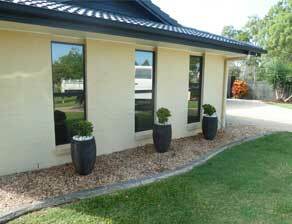 Completing your planting with decorative pebbles is a lovely way to finish off your design.